If you both enjoy sports, this is a simple and easy idea. 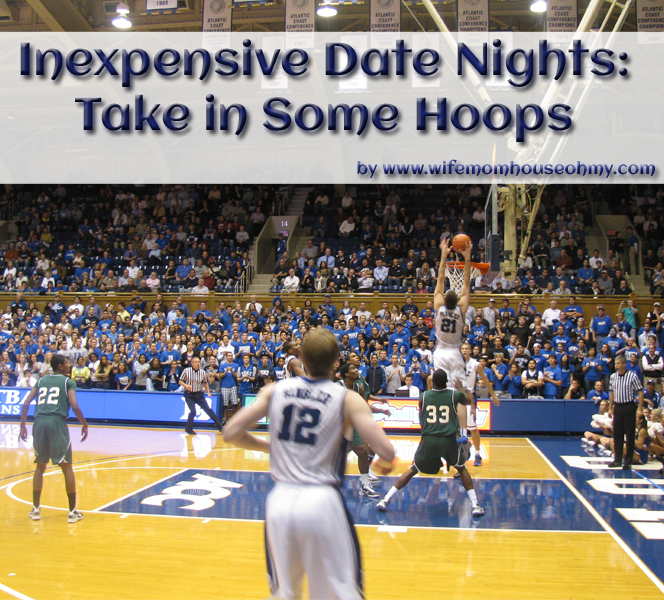 Local high school games and college sports games (with the exception of maybe Division 1 colleges) are fairly cheap. Think about $5-$10 a ticket. They are definitely way cheaper than a pro event and usually easier to get into. Pretty much every Friday night from fall through winter there is a local game some where. Oh! And a quick tip. I have found that for regular season games, schools often do not charge for freshman and JV basketball games and they can be just as exciting. Plus, you can stay for Varsity games and extend the fun! We love basketball in our house and our son even played basketball for his school and city for a while. So we enjoy this date night a lot. (Hence the take it for granted part.) In fact, my husband actually gave me my dream date using a basketball game. I am a HUGE Duke Blue Devils fan. I bleed royal. So he took me to a Duke basketball game at Cameron Indoor Stadium. It kind of took the date to a-whole-nother level but we still enjoy going to support our local hoops! Next time you are trying to thinking of a date that doesn’t hit the wallet hard, consider supporting your local tigers, knights, etc. Dawn your local school colors and enjoy a night of fun cheering on your favorite local team. Grab a hot dog, nachos and soda to share and you have a fun date night for the two of you!